TOUR GUIDE RESPONSE: All the best Codi I’m glad you have enjoy it!! TOUR GUIDE RESPONSE: Thank you so much Codi It was very nice to meeting you and your wife. I enjoyed a lot to show you my city, all the best !!! TOUR GUIDE RESPONSE: I did more than just a transfer, I showed my country, unfortunately was not appreciate it! We were excited to hear that our backup guide to Cajas would be Carlos, who had previously given us a tour of Cuenca. He is prompt, attentive, knowledgeable and passionate about his city and its environs. Although just a teaser to what the park has to offer, the tour provided an opportunity to walk around a few of the many lakes in the Cajas area. Carlos took us to two locations, one lower and another much higher. His knowledge of the plants and animals is vast. Thanks again, Carlos! Fantastic day tour by a fantastic guide for a spectacular city. Carlos is passionate about Cuenca and rightfully so. The city was a highlight of our trip to Ecuador. TOUR GUIDE RESPONSE: Thank you Chad It was a pleasure to meet you and your family. All the best! Great day with Carlos in Gualaceo and Chordeleg. Carlos is very knowledgeable and filled the day with interesting sites we likely would not have known about if traveling independently. Varied and interesting day. Super nice guy and great tour guide. Carlos was charming and delightful. He tailored the tour to our interests, and shared lots of information about the city as well as about the culture and history of Ecuador. His English was perfect. We very much enjoyed the tour and would highly recommend him. Great trip with Carlos. He was knowledgable, interesting, and overall nice guy. I definitely plan to use his services again and highly recommend him. I plan to do a birding tour with him on my next trip to Ecuador. What a fabulous tour! Carlos is very knowledgeable about Cuenca (and in general), and I cannot say enough how much we enjoyed ourselves. It was very comprehensive, and I walked away with a plethora of information about the history of this beautiful city. I enjoyed driving through different parts of the city and walking through the historic center. If you are interested in a personalized tour with a knowledgeable and very friendly guide-- this is the one! I've already left specific comments about Carlos for the Ingapirca tour. This specific tour was especially enjoyable, specifically because there was so much interaction with the local people. We snacked from different food stalls in a local market, which we would have been reluctant to do on our own. Carlos took us to specific stalls that he has used repeatedly, knowing that the food was good and the hygiene was up to standard. Three of us ate quite a bit and none of us have shown any ill effects. TOUR GUIDE RESPONSE: Thanks Royce. All the best for you and your family! Carlos was one of the best guides I have ever used from your website. Very professional, knowledgeable, and sophisticated. He was an excellent driver and extremely fluent in English. His vehicle was top notch. We can recommend Carlos with no reservations whatsoever. Other guides spoke highly of him as well, including one who said he was the best guide in Cuenca. TOUR GUIDE RESPONSE: It was a pleasure Royce, thanks for choosing me. I apologize for taking so long to do this rating. We did a tour outside of Cuenca with Carlos and it was wonderful. He explained things very well. He was flexible and knowledgeable and we had a wonderful experience. This trip was the highlight of our vacation. Carlos was so knowledgeable and friendly. We felt like this was a great value for all we were are to see. We were sort of pokey, but Carlos never made us feel rushed. I would highly recommend this tour and Carlos to anyone visiting Ecuador. TOUR GUIDE RESPONSE: Rebecca Thanks a lot for your words, it was a pleasure to meet you and it was an honor to guide and show you a bit of my country. All the best, Carlos L.
Excellent. We did all three tours with Carlos over three consecutive days. Carlos is very professional, knowledgable, and a terrific person. He introduced us to many interesting people. 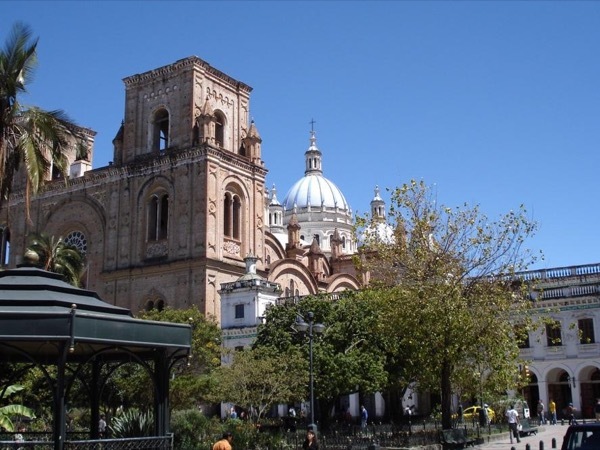 We learned a great deal about Ecuador, Cuenca and the surrounding areas. He also provides a very nice and comfortable vehicle. Very highly recommended. TOUR GUIDE RESPONSE: Thank you both, it was an honor to show my country. All the best, Carlos L..
TOUR GUIDE RESPONSE: Dear David and Teresa Thank you both, it was an honor to show my country. All the best, Carlos L..
TOUR GUIDE RESPONSE: David and Tresa It was an honor to show you a bit of my country I'm so glad I meet you, you both are wonderful people and I wish you the best. Thank you for visit Ecuador. Carlos L.
Carlos, did a custom tour for me during my visit to Cuenca, Ecuador. He was extremely knowledgeable about the area and professional. His personality made the day very enjoyable and he was a joy to be around. I would highly recommend booking time with Carlos, than taking one of the tours offered in town. You will not be disappointed. TOUR GUIDE RESPONSE: Thank you so much Mary for your kind words!! All the best! Excellent tour. Guide was personable and went out of his way to show me the best of Cuenca as a solo traveler. Our Cuencano guide Carlos was gracious and friendly, despite a terrible cold. He was professional and informative at every minute, even though I'm sure he would have preferred to be at home drinking hot tea. We had a lovely day with him, exploring the basilica at Biblian, enjoying lunch at the lovely Posada de Inga Pirca, and exploring the Inca ruins of Inga Pirca. We would happily recommend him to other visitors to Cuenca. Thank you, Carlos, for a great day touring Gualaceo and Chordeleg. We appreciated your knowledge of the area. We had a great time! TOUR GUIDE RESPONSE: Dave and Janet Me too, I was a great experience touring you to Gualaceo and Chordeleg. Thanks again. All the best, Carlos L.
Carlos is a great ambassador for Cuenca! He has a vast knowledge of the city, and is very proud of his town and country. He drove us around Cuenca to get us familiar with the area then we did a walking tour of the old town center. Very nice! Thanks Carlos, we look forward to returning and taking some of your other tours. TOUR GUIDE RESPONSE: Thanks a lot Janet and Dave I had a great time with you, you are such a wonderful people, thanks for choosing me to show you Cuenca,I hope you have the change to come back in the future. All the best, Carlos L.
Carlos was a delight. He was professional, personable and know his history and culture. He pointed out various spots of interest along our trip and made excellent suggestions for lunch. He made our day and I would suggestion Carlos to anyone touring Ecuador!